This item is based on the Project Read system, which I did not create. I made this small set of flash cards to use in my interventions. I will add each set as I go. I use them not only as flash cards to flash to a small group. I also have the students flip them over as a game and say each word: if they say it correctly, they keep the card. If not, they put it back on the table face down. The person with the most cards wins (usually a sticker.) Could be used as assessments as well. 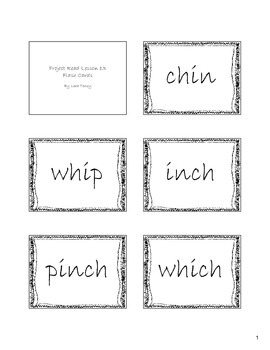 Call out the word and have the student find it from a face up arrangement, or to flash individual words to the student to keep them from flying too quickly down the list. DON'T PRINT PAGE THREE - my pdf printer on the computer adds an extra, unnecessary page.